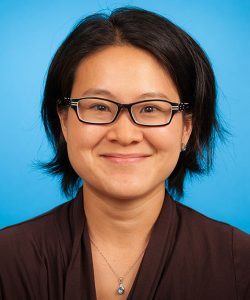 Dr.Elizabeth Young, MD, FRCPC is a general consulting and developmental pediatrician in the Department of Pediatrics at St.Michael’s Hospital. She is also a lecturer at the University of Toronto. She completed medical school at McMaster University and a Pediatrics residency at Queens University. She worked as a general pediatrician for two years in Toronto and then went onto then complete her developmental pediatric sub specialty residency at the University of Toronto. Her dual training and work experience in developmental and general pediatrics provides her a unique perspective in the management of families of children with developmental disorders. In 2011 she created, developed and introduced Pediatric Developmental Passport in the Pediatric Clinic at St.Michael’s Hospital with grant support from St.Michael’s Innovation Funds for a pilot randomized controlled trial. The Passport has been reported to help the unique population of children here at St.Michael’s hospitals that are typically from low-income families. Through multiple presentations of the results of the first three phases of the pediatric developmental passport at various conferences around Canada, Dr. Young has generated interest and support in the passport by general and developmental pediatricians nationally. As a new investigator Dr.Young strives to foster understanding and promotion of optimal development of children by bridging the communication gap between families with a child with a developmental disorder, developmental specialists, primary care physicians, and agencies promoting child development.